Linette Boisvert is a sea ice scientist at NASA’s Goddard Space Flight Center in Greenbelt, Maryland, and researcher with Operation IceBridge. The mission of Operation IceBridge, NASA’s longest-running airborne mission to monitor polar ice, is to collect data on changing polar land and sea ice and maintain continuity of measurements between ICESat missions. 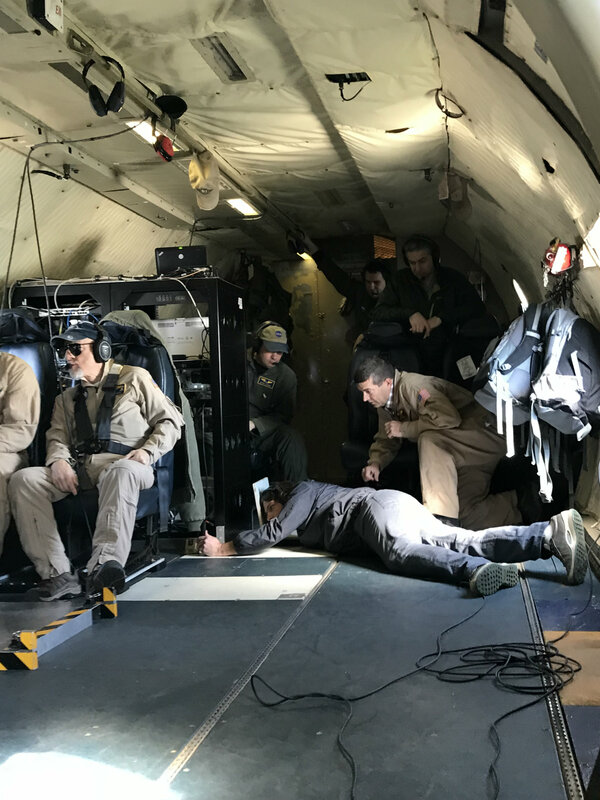 This blog describes test flight activities before the mission’s spring Arctic ice survey, which began on March 22 and will be ongoing through most of April. I woke up not as optimistic as the morning before. With the previous flight’s turbulence and motion sickness, I was not looking forward to some of the maneuvers that we were going to do. 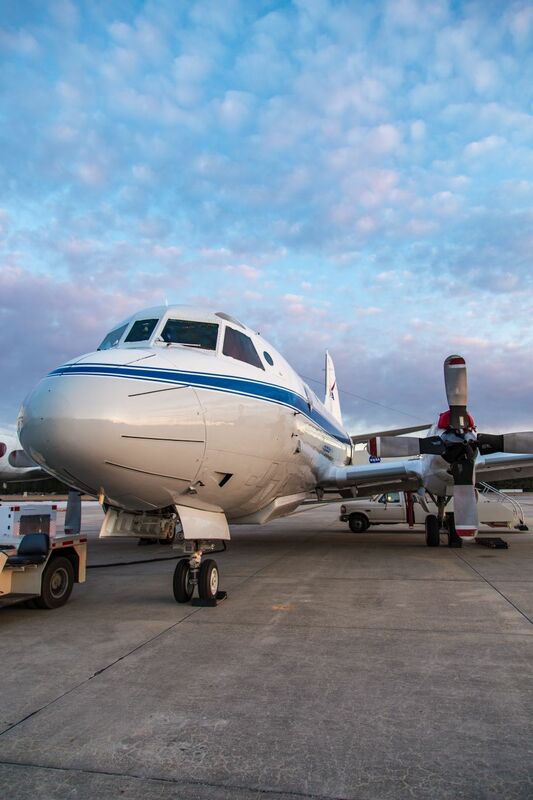 But I reluctantly went back to Wallops and got back on NASA’s P-3 Orion research aircraft. The plane was a lot less crowded for the radar test flights. A few of my friends poked fun at my vomiting on the previous flight, and I jabbed back, saying, “Take a cookie, they taste just as good going down as they do coming back up.” Yes, I still had cookies to dole out. After this, I immediately went to the cockpit to apologize to the pilots and flight engineer for puking where they work. 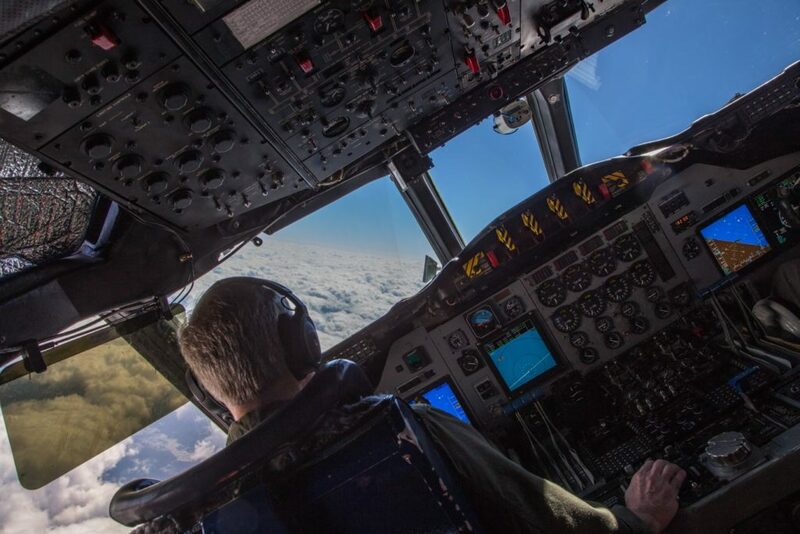 This flight was to test the Center for Remote Sensing of Ice Sheets (CReSIS) radar. The CReSIS radar on OIB is used to determine the thickness of the snow pack on top of the sea ice and the different accumulated layers of snow on the Greenland Ice Sheet. The flight would be six hours in duration and would fly south to Norfolk, Virginia, then turn due east and head 200 miles out to sea to do the maneuvers that were required by the radar teams. These maneuvers consisted of slow rolls, quick, 60-degree rolls at 1 degree per second, and elevation-change maneuvers (ups and downs). Those aboard assured me that this flight would be much smoother due to the higher altitude (~20,000 feet) and the fact that we would be flying over the ocean. They did not disappoint! This flight was smooth and unlike any flight I have ever experienced. I spent a lot of time in the cockpit for the best views and also because it was much warmer there than the rest of the plane. I must admit, I was a little nervous that I might have motion sickness again, but thankfully I did not. I began talking with the P-3 flight engineer Brian Yates and he let me sit in his seat for about 30 minutes. This is the best seat in the house—in the middle of the cockpit—and might I add that it reclines! This is a luxury not afforded to ANY of the other seats on the P-3. 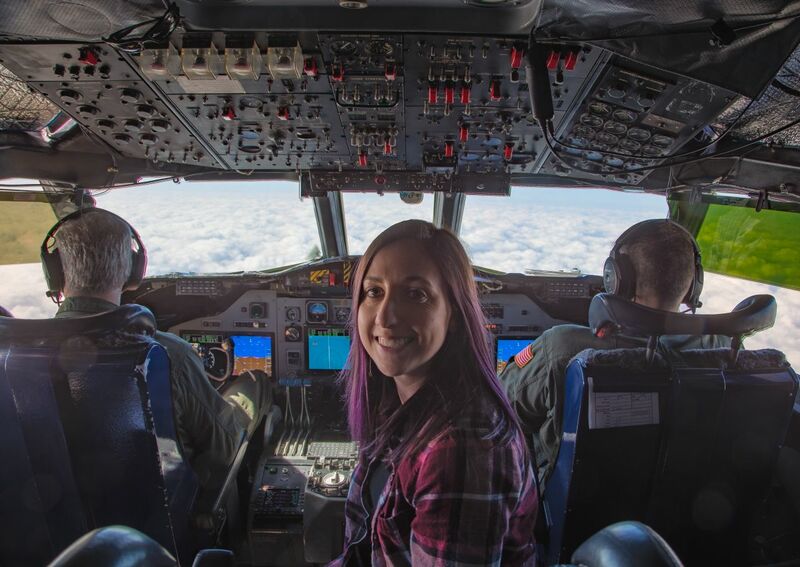 Lynette Boisvert smiles for the camera while in the flight engineer’s seat in the cockpit of the P-3. The first time they did a rolling maneuver you could feel the g-force on you, and as the blood was being pushed from your head, it felt as if you could not move your feet from the ground. It was a very interesting feeling and I felt a little like an astronaut. For the faster, 60-degree rolls, they had me stay in the cockpit. I was a little nervous for what I was in for. These rolling maneuvers were kind of like being on a carnival ride, and the back-and-forth lulling motions kind of made me feel like I was being rocked to sleep. During this time, I looked back from the cockpit into the rest of the plane and noticed on John Sonntag’s computer our flight line, or as John puts it, “the pilots are drunk” type of flight path, and laughed. The flight path during the roll maneuvers. Afterward were the up and down maneuvers at different elevations. Again, I was seated in the cockpit, and this felt more like being on a rollercoaster. 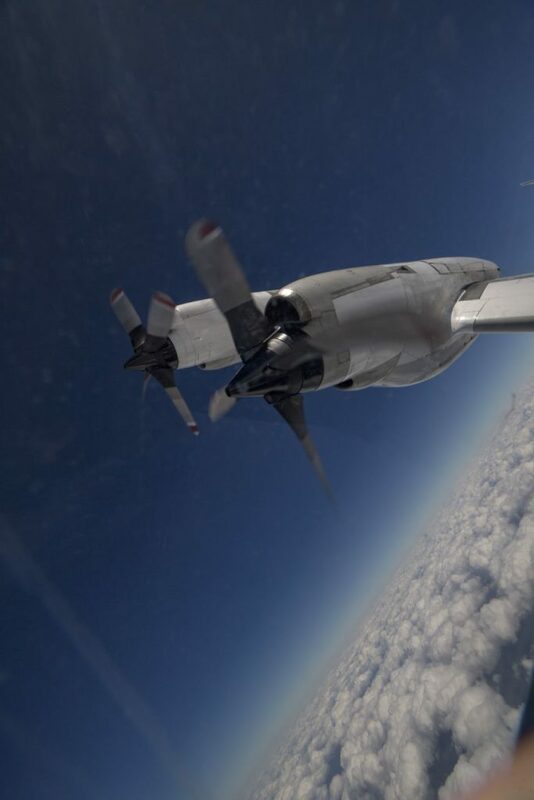 What I thought was the most interesting aspect of this maneuvering was flying into the cumulus—puffy, cotton candy clouds—and getting to experience it head-on from the cockpit. The updrafts and downdrafts present in the clouds, produced by the mixing of air causing condensation and creation of water droplets to sustain themselves, made for a little turbulence, although nothing like what was witnessed on the prior flight. During landing I was able to sit on my ledge in the cockpit, which is always a thrill. Luckily, the landing was smooth and we were back at Wallops Flight Facility. 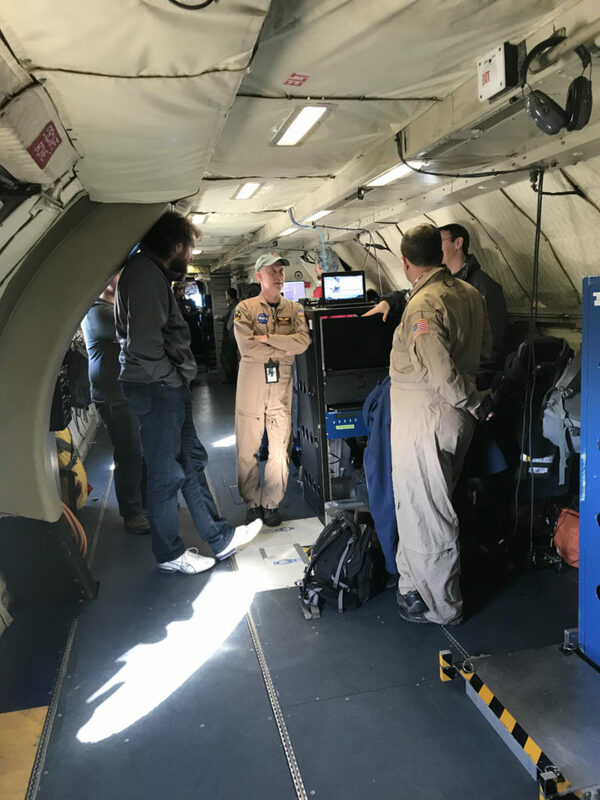 Throughout all of this the CReSiS radar teams were working frantically, all huddled around the workstation of remote sensing expert John Paden from the University of Kansas. 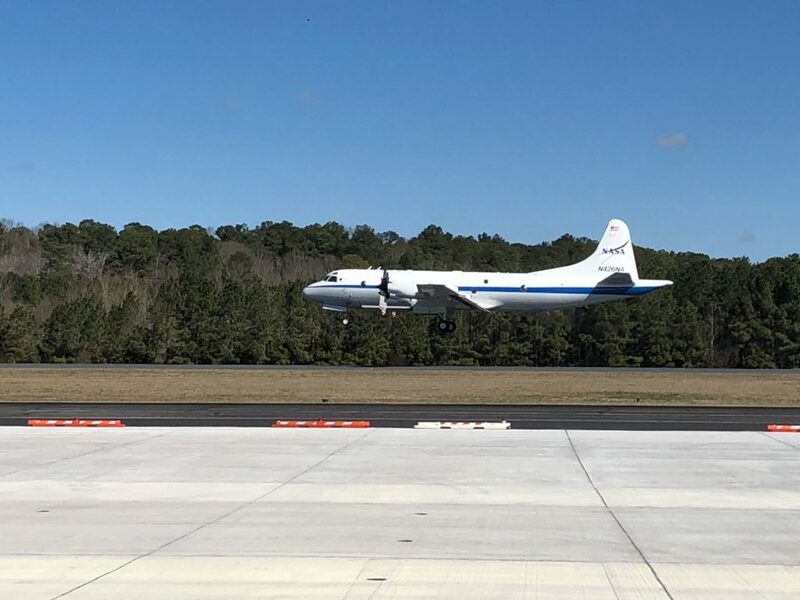 It appeared as if they were having problems, but if they were, they must have resolved any issues because radar data were successfully collected and calibrated during the flight. As Melinda and I drove back to NASA Goddard Space Flight Center, located in the concrete jungle of the D.C.-Maryland suburbs, much different from the coastal, rural area surrounding Wallops, we reminisced how much fun the test flights were and how it is always so fascinating to see exactly how the instrument teams work and how the data are collected—data that we use to study the rapidly changing conditions of the Arctic sea ice. It is also so inspiring to see how dedicated these people are to their jobs and to the OIB mission itself. They spend multiple months away from home in the Arctic and Antarctic, collecting data for scientists and the public to use. During this time they become a family, a cohesive unit, working together to complete successful flights. In some ways, they are like P-3 cowboys riding into the great unknown, wrangling this vastly important data for those of us sitting behind a desk on the ground to use and study. They are the true heroes, and for this we are truly grateful. And click here for part 2 of Linette’s blog. I woke up early Wednesday morning at our shared “beach house” to make coffee and was greeted with a beautiful sunrise from the front porch over Wallops Island and the NASA water tower in the distance. Sipping on my coffee, I had high hopes that this was going to be a great day. Coincidentally, Kyle Krabill, Airborne Topographic Mapper (ATM) ground GPS guru, and John Sonntag, the legend and the man behind why the Operation IceBridge (OIB) missions run so smoothly, were at the Wallops Flight Facility doing a calibration of the NASA P-3 Orion research aircraft’s GPS antenna. 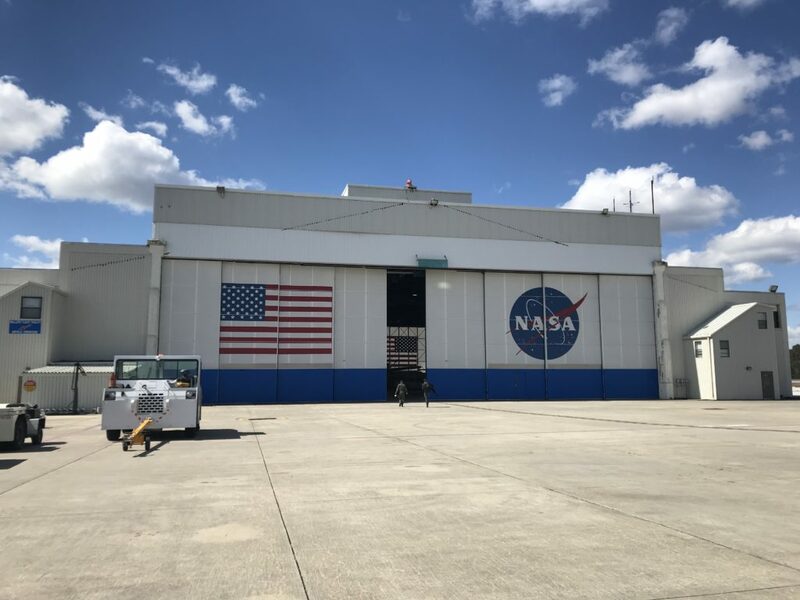 My colleague and friend Melinda Webster and I arrived at Wallops at 8 a.m. on this clear, brisk and windy morning, driving around the grounds trying to find the D-1 hangar. However, it didn’t take us long to find it, as we saw the tail of the P-3 sticking above a few buildings. 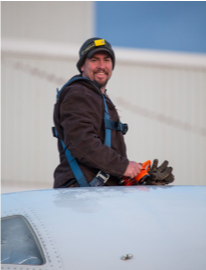 We headed over and immediately saw Jeremy Harbeck, OIB’s resident photographer, data analyzer and pun-master coming out of the hanger door with a big smile on his face to greet us. Inside, we watched an informative, somewhat corny pre-flight safety video (don’t wear open-toed shoes or heels on the plane) before the flight. After the video, we were free to board the plane, and as we walked on the tarmac, careful to mind the P-3’s propellers, we noticed the wind had picked up significantly. 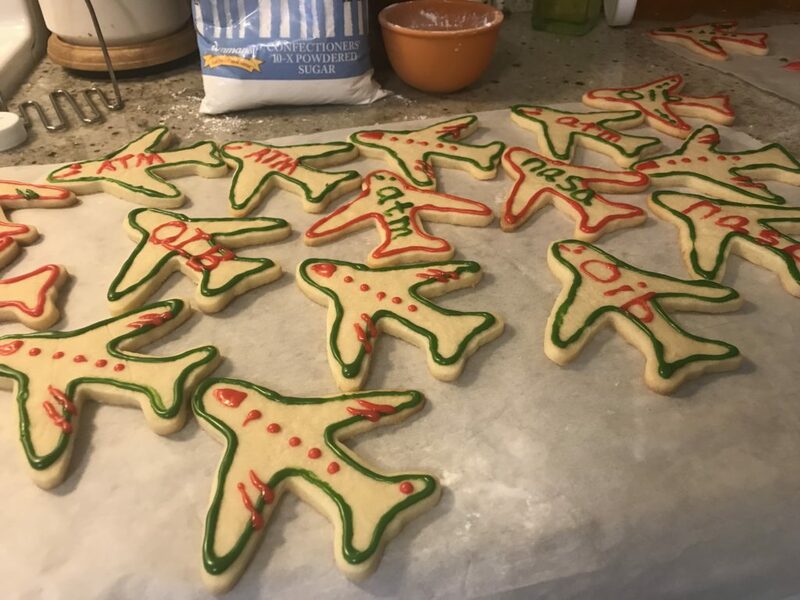 In hand, I carried homemade sugar cookies shaped like airplanes, decorated in red and green icing with words like “ATM” and “OIB”; red and green to signify the red and green lasers on the ATM. With these cookies, I was determined to win over the instrument team members, pilots and flight crew who I did not know well and to put smiles on everyone’s faces. I wanted to come out of my shell and get to know everyone and learn how the teams worked. As I was handing out cookies, each engineer and flight crew stopped what they were busily working on to chat and munch on the cookies before getting back to it. Everyone on the plane was frantically working and knew what they had to accomplish before the flight. 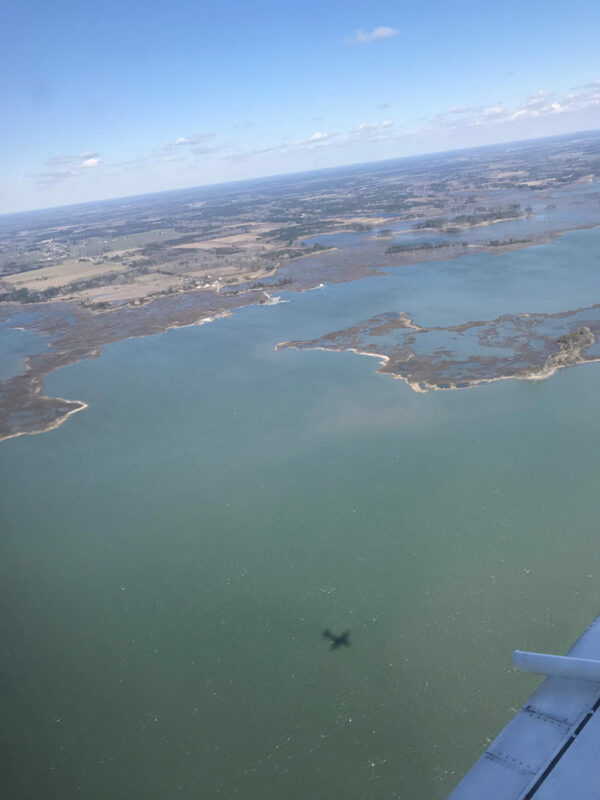 As we were hanging out in the plane we noticed that the strong winds that had picked up since the early morning were causing the plane to shake. No big deal, we thought. 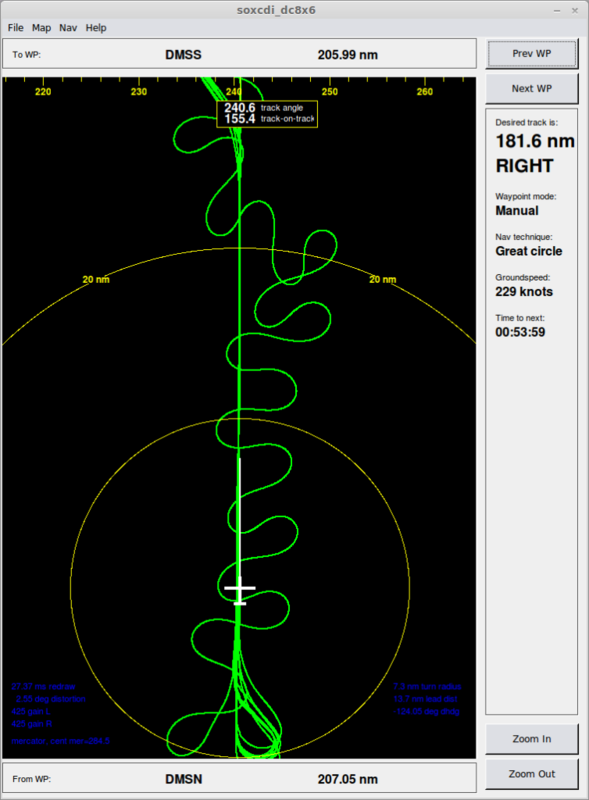 The day’s two-hour flight would be to test the ATM lasers and the Digital Mapping System (DMS) camera in order to make sure that they were calibrated in the air on the plane for the science flights over Arctic sea ice and the Greenland Ice Sheet. We would fly 1,500 feet above the surface along the coast to Bethany Beach, Delaware, back south over the ocean to a buoy measuring wave height (for scientists at the University of Washington’s Polar Science Center, because science never stops, after all), and then a series of six “ramp passes” at different altitudes over the Wallops Flight Facility runway, where highly accurate ground GPS surveys have been taken for calibration. ATM surface elevation data are used to infer the thickness of the sea ice pack from the “freeboard”—how high the Arctic sea ice extends above the ocean surface—and for surface elevation changes and mass loss from the Greenland and Antarctic Ice Sheets. View of the Atlantic Ocean and eastern Shore of Maryland. The P-3 took off as it normally would, as I’ve been on it a few times before with OIB, with a little bumpiness; however, once we were up at 1,500 feet the turbulence did not go away. Not thinking much of it, Melinda and I had moved to a window to watch the coastline below (it was very odd to NOT view sea ice out of the P-3 window) when I began to feel a little bit funny, despite everyone around me looking fine and happy. Now, flights over sea ice are not very turbulent because the boundary layer over the ice is often very stable due to the small contrast in temperatures between the cold ice surface and cold air above. However, 1,500 feet above the land and so near the Atlantic Ocean, there are drastic temperature differences between these surfaces, both ocean and land and also the air above. Mix that with strong winds and sunny conditions warming the surface, and you get thermals and instability with the air in the boundary layer. In simple terms, this means lots of turbulence, and lets just say I was not used to it. Taking pictures was not making the feeling in my stomach go away. With this feeling growing worse, I asked Melinda, still smiling and happy, if she could find me a container to “lose my breakfast” in. She came back quickly with “sick sacks,” as they are called, thanks to the quick reaction time of Michael Studinger, a seasoned ATM and airborne veteran, and I was told to go in the cockpit and look at the horizon. It supposedly helps. So I went and sat on my ledge in the cockpit, my usual spot during normal sea ice flights, but the motion sickness feeling was not letting up. Finally, I “let it go,” as a Frozen Disney princess once said. Up came my airplane cookie, which made its way into my sick sack right there in the cockpit. How embarrassing. On top of that, I was too afraid to move. After six torturous ramp passes and unending turbulence, we finally landed back at Wallops. The turbulence was no big deal to the pilots, underscoring, again, the seasoned veterans’ expertise. 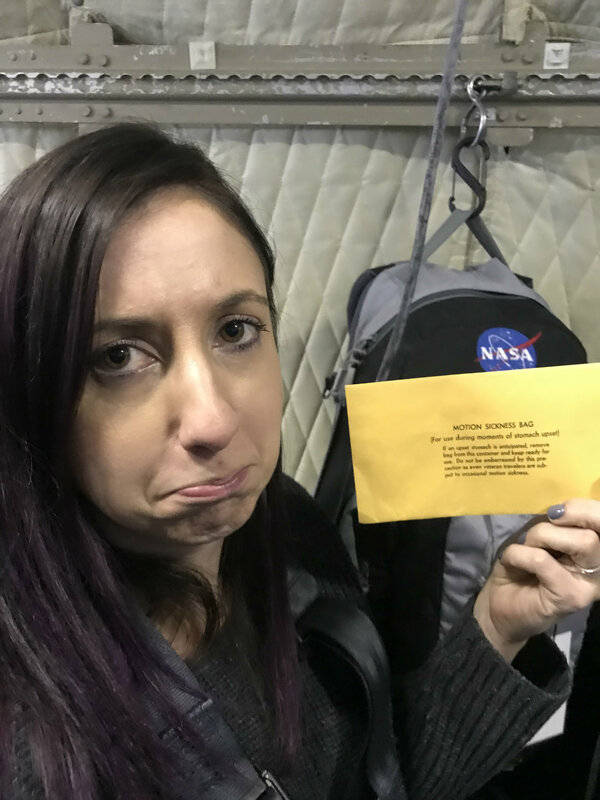 Needless to say, I was not sad that this flight was over, but I was pleased to hear that all of the instruments had no problem collecting data on the flight, which in large part was due to the instrument teams’ efforts. It is also clear to see that these people love their jobs and what they do so much that they are willing to—and even often do get—motion sickness on the plane and keep on chugging along.